Alexander Smith’s tattoos were done at Addiction NYC by two different artists at different times. His Sun & Moon tattoo was done by Liz and his Hawk was done by Tom Solomon. Alexander is a professional copyeditor and a poet. His poetry has been published in Frequency Writers anthology, Missing Providence, and can be found online on Get Well Soon Zine. ZO Magazine has accepted his graphic poem for the 2015/2016 Poetry Exposés, which goes live on 1/2/16. His book, For Poets Must Love: Poem Compilation, is available on Amazon — go get it! I’ve traveled 3,000 miles to get a needle stuck in my arm hundreds of times. More than once. 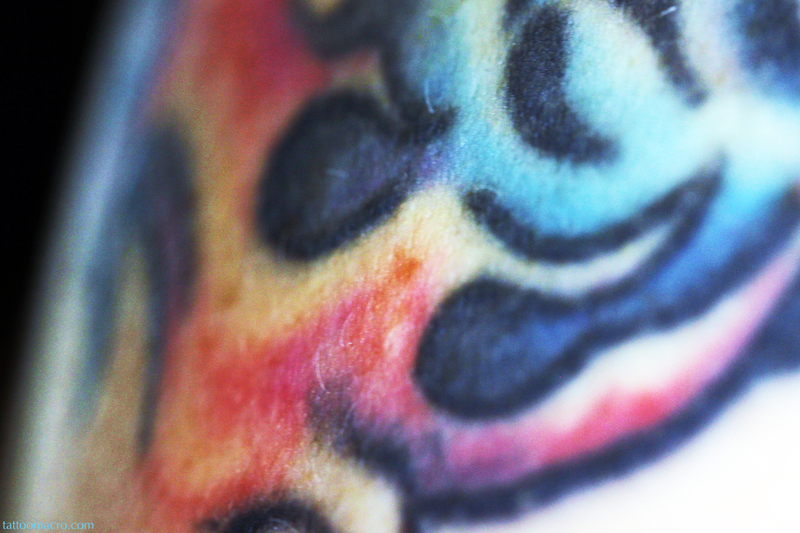 In that parlor with the derelict name behind the head shop, I met two artists – foreigners – who imprinted beautifully and precisely patterned ink onto my body. Liz, a British, expat. And Tom, a former Israeli soldier. I remember stepping past the glass pipes into the darkly lighted, leather-couch-lined walls of Addiction NYC. Behind the slanted counter, Liz slumped, writing on a paper scrap. She looked up and offered her introduction. I pointed out a water-fire, sun-moon design and my vision of a connected wheel-like shape. Head to toe. Day to night. The moon and sun would lie. My family sat on the red-leather sectional that midwinter afternoon. As I, anxious and impulsive, walked past the black, slanted counter and rolled up my sleeve. A new piece of me was born. Two years and several months later. With my Los Angeles music studies finished, I followed my writer’s dream to Portland. Until another family visit brought me back to Manhattan. And with incredulity, I found myself walking past those glass pipes again. The bird that flew across my thoughts during my clouded and isolated Portland months had transformed from a scavenger crow to a majestic hunter. And it demanded its release from the cage of my mind. I followed Tom back behind the slanted counter. With a painstaking meticulousness, I previously had never encountered, he forever stenciled the hawk onto my right shoulder. And imbued it with blue-eyed sight. With the work complete, Tom turned me toward the mirror. Blood. Ink. A smile. The same smile that had appeared those few short years before when I turned to the same mirror with Liz at my other arm. A smile of relief – and pride –which bared my teeth.